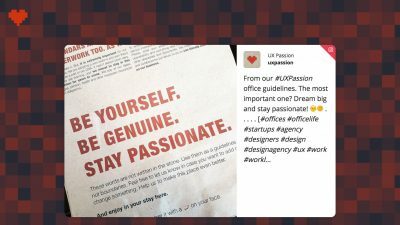 nleash your creativity and together with Wallery design beautiful social media hubs and social media walls guaranteed to wow even your most demanding clients. We have designed Wallery to be able to be much more than just a social media wall. Your clients will be delighted with many features Wallery has to offer – and you will be excited to come back to Wallery time and time again once you experience the ease of use of our product. As a premium user, with just one Wallery account you can create multiple walls and hubs to sell to your clients. Set your own prices and activate your walls whenever you need them. Once your client’s event is over you can redesign the wall, or simply delete it and craft a new one. Sounds good? We thought so! Our Tiles layout, displaying the #UXPassion hashtag. 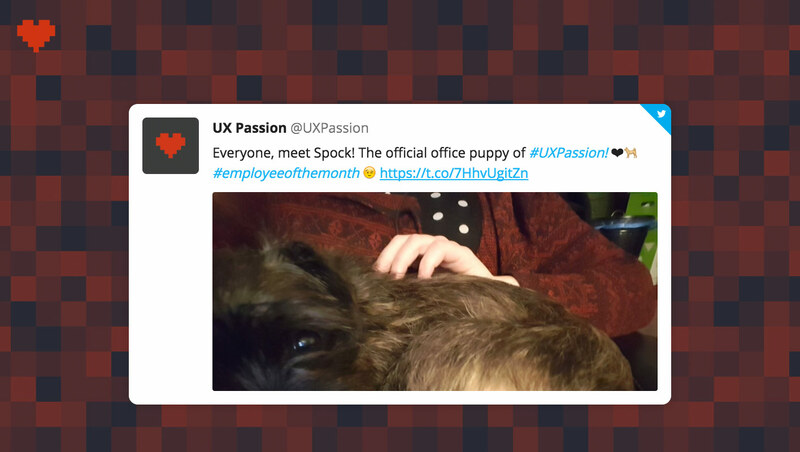 Our Single Item layout, displaying the #UXPassion hashtag. Our One Column layout, displaying the #UXPassion hashtag. Our discovery and curation features allow you to have full control over the content being displayed on your clients' walls and hubs. You can guarantee them only relevant and positive social conversations will make it there. To help you with curation we've implemented whitelists and blacklists which are both reliable and easy to create and use. Your many clients each have their own unique brand guidelines. With Wallery, you can design solutions that will follow those guidelines every single time – without fail. 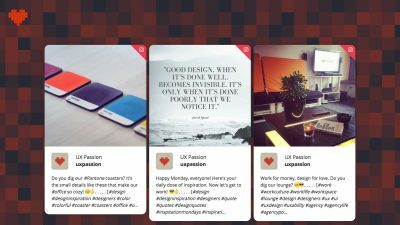 Create a wall or a hub using their brand colors, choose to display their logo and decide how social media avatars will be displayed. Go beyond that and adjust fonts, background images and much more! You can display earned, owned and a mixture of both earned and owned content wherever your client needs it. Embedded on their website, displayed on a big screen or projected onto a wall – Wallery is designed to adjust and fit beautifully on any screen or surface. You can display social media conversations from Twitter and photos from Instagram on one wall or choose to display them on two different walls. As a premium user you get to create multiple walls and hubs with one single account – at no extra cost.